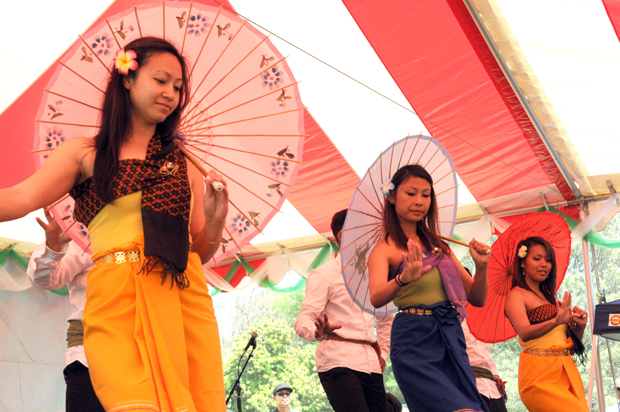 On Saturday, the 13th annual Cambodian New Year Celebration was held at El Dorado Park, ringing in the year of the snake. Though the actual Cambodian New Year that welcomed in the year 2557 BE was from April 13-15, the El Dorado Park festival is a long-standing tradition for members of the local and regional Cambodian community and entire families come to take part. Among celebration festivities were a multitude of traditional dance groups that highlighted the culture’s rich musical and theatrical heritage. Contemporary musical acts with Cambodian roots–like Long Beach’s female-fronted reggae hip-hip fusion group Universal Speakers, New York based rapper-singer Joanlee–along with several other spoken word artists performed on the festival’s main stage. The most packed events of the afternoon, however, were those of Hella Chluy, the parody songwriting comedian, and Miss Cambodia, Phanith Rama Sovann. There was also an outdoor stage near the food court hosting Ankor Idol, a worldwide Khmer singing competition. In addition, members of the Cambodian Coordinating Council and Miss Long Beach gave moving speeches on ways to motivate the Cambodian community into participating in more events to benefit Cambodia Town. Hundreds of booths offering everything from Cambodian event planning to Khmer-inspired clothing lined the festival grounds, showcasing a mix of traditional culture and American influence typical of today’s Cambodian experience.